It is almost exactly 50 years now since Vladimir Ashkenazy made his first Bach recording for Decca ‑ the D minor Concerto with the LSO under David Zinman ‑ a recording which I believe has never been out of the catalogues. Although he has recorded other works by Bach in the interim, particularly the '48', his discography of the composer has never been large. 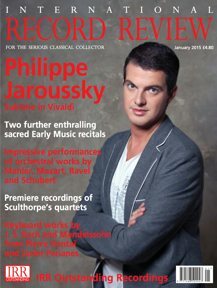 During the past half‑century, performances of Baroque music on authentic instruments have become very much the norm, although in recent years a return to 'Bach on the piano' appears to have taken place, and whereas daily practice will have kept Bach's keyboard works in the forefront of Ashkenazy's mind (as in the mind of all pianists), we as record collectors have been somewhat denied the results of his insight into‑Bach's artistry. If you are going to play Bach on the piano, this is how it should be done. The programme has been cleverly chosen in terms of Bach reaching out beyond the confines of Lutheran Saxony towards the more pervasive (in those days) Italian and French schools, albeit remaining himself at all times. This does not mean that there should be anything particularly ‘stylistic’ in the performance of the D‑minor Concerto, BWY974, 'after Marcello' , or the familiar Italian Concerto, but the dances in, the French Ouverture (Bach's own spelling) and the Italian manner' of the Variations bring their own subtle, variations of touch, phrasing and rythmic emphasis ‑ all of which Ashkenazy gives us on this very fine recording ‑ most notably in his playing of the Bourrées. 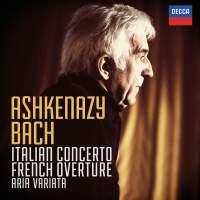 It is quite clear from this disc that if Bach has not featured so much in Ashkenazy's programmes, it has never been far away from his heart and mind, for his playing is always vital and musically deeply intelligent. Ashkenazy's technique is as superb as ever it was ‑ which is saying something. As just one example, his realization of the fuge,in the French Ouverture is astonishingly compelling ‑ those left‑hand runs are more than immaculate, always en bon point ‑ if you (and he) will pardon the use of the phrase (and certainly not embonpoint!). Such a combination of lithe, stylish and precise playing with poetic and sensitive phrasing, always shapely and tasteful, is rarely encountered. The recording is gooh, but I would not be surprised to learn that the Courante and Gavottes in BWV831 were recorded on different days, for there is a slight variation in recording balance, or even microphone placing, to suggest this ‑ not that one's appreciation of Ashkenazy's artistry is impaired. It is good, too, to encounter Peter Williams's very good booklet notes, making the little‑appreciated point of the varied tonalities in Book 2 of the Clavierabung, and why they are varied, as well as intelligently placing Bach's keyboard works in context.